Most people feel their most creative when they were children, basking in the joy of creation, unleashing their imagination without any constraint. Jyoti and Suresh Guptara, known simply as the Guptara Twins, born to English and Indian parents, but raised in Switzerland, banked on their creativity, by writing a bestselling trilogy called the Insanity Saga out of fragments of a story they had cooked up, when they were merely eleven-years-old. After working on writing it for six months, Jyoti and Suresh Gupatara proceeded to the second logical step -finding a publisher. It took them six long years to see their story, Conspiracy of Calapsia, book one of the fantasy trilogy, Insanity Saga, in print. But it was worth it. Published by Tara Press, a subsidiary of India Research Press, the book was first published in English but has also been translated to German, Dutch and Italian. The Conspiracy of Calapsia is a fantasy novel set exclusively in the antiquated world Calapsia, an alternate universe in which a teenage heir fights to save his financial empire from an evil thought to be extinct. The twins landed a six-figure contract, were bestowed upon Scroll of Honor for Special Services to the County of Los Angeles and hit India Fiction Bestseller List at the tender age of seventeen. And thereon began their path to literary success. At the age of fifteen, Jyoti became the youngest known journalist to publish a piece in The Wall Street Journal. The twins both appeared at the Geneva World Youth Summit for ICT and Youth for Development in 2007 as Youth Ambassadors for NBAU(Knowledge Transfer Beyond Boundaries ), a partner organization to the United Nations. They were also invited to speak at Switzerland’s most prestigious literary festival, the Solothurner Literaturtage in 2008 and 2009. “Leaving school at the age of fifteen to pursue writing full-time has taught me that schooling and education don’t have to be the same thing, and can indeed be at odds.” says Jyoti, during our interview. 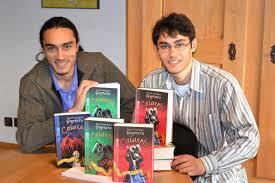 The Guptara Twins are ambassadors for World Vision Switzerland, donating ten percent of their earnings from the German edition of the second book, Calaspia. Der Schwertkodex, as well as commending the charity’s work in schools and public readings. They have been covered intensely by international media and are fluent in English, German and Swiss German. When asked about their best achievement was when, after a school reading, they mentioned a moment when a few children bought the entire trilogy even though they said that they didn’t normally read . “I write to give readers an adventure that will hopefully keep them thinking about the characters and situations long after they’ve finished a story.” maintains Suresh. During our interview, Jyoti mentioned that he is currently working on two books, one about a Non Resident Indian (NRI) girl whose family’s dark secret forces her to face it and the other about an educational start-up that poses a threat to the people in power. For the twins, the last time they wrote together was when they created the last part of the trilogy. Jyoti mentioned that “writing books in the face of rejection has taught me perseverance.” Talent, or as in their case double the talent, combined with the ability to never give up, has made their childhood novel a bestseller.